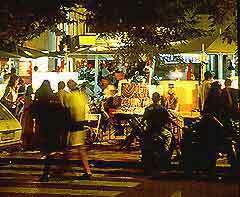 The Balearic islands provide excellent shopping, which is so typical of Spain. The island of Ibiza comes with many clusters of shops and these are particularly concentrated around the streets of Ibiza Town, along the Avenida de Espana, the Avenida de Ignacio Wallis and the Paseo de Vara de Rey. 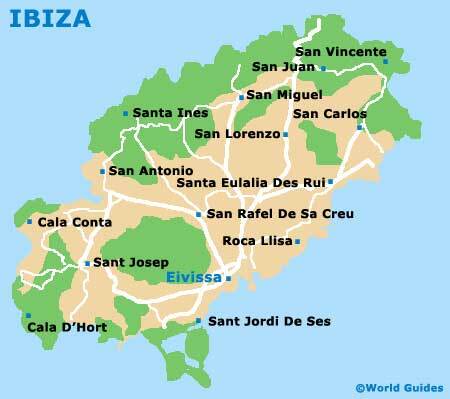 The larger shops in Ibiza usually open from 09:00 to 21:00, particularly in the principal tourist centres. Some shops do close between 14:00 and 17:00, in time for the traditional Spanish afternoon siesta. The numerous beachfront shops stay open until late at night and during the high season, the most popular stores open seven days a week. Provincial towns and villages do not usually have such regular opening hours and are not really aimed at tourists. Markets in Ibiza provide the ideal place to purchase fresh local island produce, offering hearty snack-food for those headed to the beach for the day. There are also 'hippy' and artisan markets around the harbourfront, as well as in the towns of Sant Antoni de Portmany and Santa Eulària des Riu. Ibiza has a number of small, interesting shops that offer a wide range of souvenirs, and also many larger stores. Shops can be found all over the island, but in particular within the historic areas and also in tourist centres, near to the beaches and harbours. There are also shopping centres and precincts on the beachfront, selling espadrilles (traditional footwear in Ibiza), beach mats and sun-block cream. Ibiza offers a number of interesting food products specific to the region, such as delicious 'ensaimada' pastry, which is beautifully presented in a box, gourmet spicy sausages, olives prepared in many different ways and strings of dried peppers. Wine in the Balearic islands is well worth trying and nearby Mallorca is well-known for producing some of the best wine in the whole region and a popular wine festival is held every September in Mallorca. Food and wine is widely available in shops, well-stocked supermarkets and at many of Ibiza's popular markets, where some of the island's delicacies can also be sampled. Markets have become an important part of life in Ibiza and are held at weekly intervals, mainly in the provincial towns and villages. These busy markets are full of local atmosphere and serve both the local population and also offer many goods and souvenirs for tourists and visitors to the island. Some of the markets in Ibiza sell fruit, vegetables and local produce, besides numerous domestic items, clothes, jewellery and leather goods. Markets tend to start in the mornings and end later, some time in the afternoon, with a number being held every day during the island's high season.